In part 1, I discussed the differences between the definitions of photoactivation and photoswitching. Here, I want to talk about some of the applications of the various classes of photochromic dyes. Photochromism typically is used for modulating the absorbance or color of a solution or material. 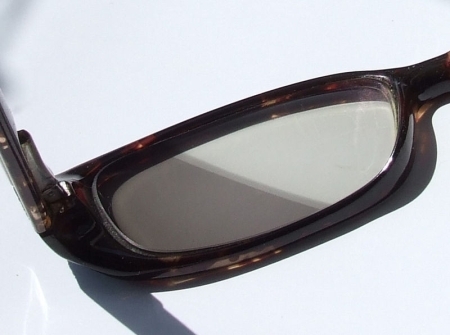 The most obvious example is sunglasses that tint in the sunlight. Photochromism can even be applied to batteries! Photoactivation is ideal for situations you want an emitter to start in a dark form, be controllably activated to a bright form, emit many photons, then disappear irreversibly. An example application is tracking single molecules when the concentration of molecules is high: you want the probes dark to start to maintain a low background, and you want the probe to turn on irreversibly lest the emitter switches off quickly and you can no longer track it. 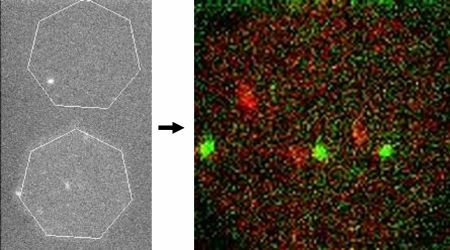 Another perfect example is super-resolution imaging (via photoactivation and localization) of relatively static structures: you want to turn on a sparse subset of emitters, localize them once with high precision (requires many photons), then have them disappear permanently. 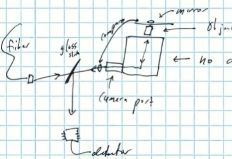 Using a photoswitching probe for imaging static structures isn’t ideal, because relocalizing the same spot over and over wastes time and complicates the subsequent image analysis. 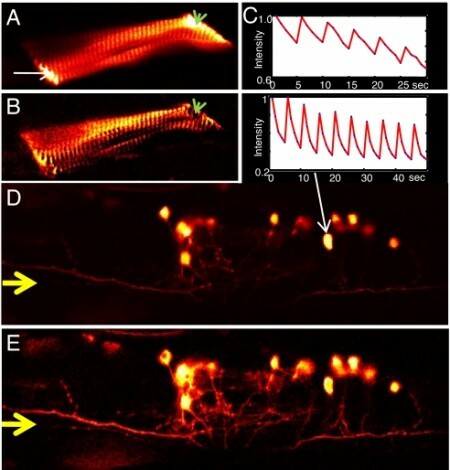 Photoswitching is ideal if you want to relocalize over and over, such as if you are performing super-resolution imaging on a moving or dynamic structure. 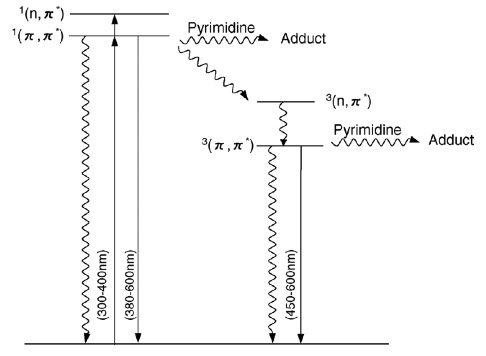 Photoswitching can also be applied to speckle microscopy, which follows fluctuations in dynamic filaments. Others have used photoswitching to modulate a probe, lock-in to that modulating signal, and filter out the unmodulated background from nonswitching fluorophores (see OLID, figure below). 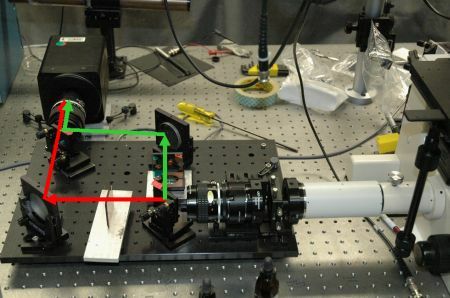 Photoswitching is also necessary for super-resolution techniques such as STED and structured-illumination, which require many cycles of bright and dark. In fact, both these techniques require photoswitching that is very robust and lasts many many cycles. Side Note Regarding Photons: It is important to note that a compound being switchable does not necessarily mean that it will ultimately emit more photons. In many cases, cycling emission simply spreads the photons into many bins: the total number of photons emitted over all the cycles sum up to the same number to the situation if the fluorophore had been on continuously. For instance, if the unswitching form of the fluorophore usually emits about a million photons (for the best organic dyes), then you cycle it with each cycle emitting 10,000 photons, the photoswitch will generally last 100 cycles on average before photobleaching. On the other hand, it is conceivable that a photoswitch could resist photobleaching better than its continuous analog. For instance, if the fluorophore bleaches via producing triplet oxygen that builds up around the dye—eventually colliding and reacting with the compound—then switching to an off state might offer some time for the built up concentration of triplet oxygen to dissipate. 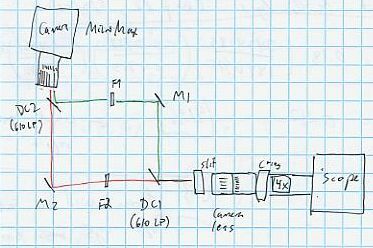 On the third hand, if the switch is capable of bleaching from the dark state, then switching may ultimate reduce the total photon count (e.g. the imaging light may pump the dark form into highly excited triplet or other states, leading the compound to basically explode). In general, photochromism refers to the reversable light-induced transformation of a compound between two forms that absorb different energies or amounts of light. By switching between the forms, the color of a solution of the chromophore changes. One or both forms may be fluorescent, but it is possible that neither form fluoresces significantly. Frisbees or beads or shirts that change color in sunlight probably contain some photochromic molecules that are switched using UV irradiation. Common photochromic compounds include azobenzenes (structure above), diarylethenes, and spyropyrans. Photoactivation refers to the irreversable light-induced conversion of a fluorophore from a dark form to a fluorescent form (or from one emission color to a significantly shifted color, e.g. blue to red). Typically, a chemical reaction transforms the compound, thus making the photoactivation irreversable for all practical purposes. 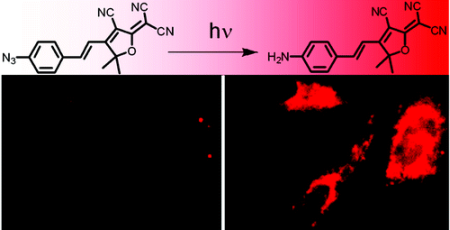 For this reason, a photoactivatable fluorophore is sometimes referred to as being photocaged. There are several photoactivatable fluorescent proteins, such as PA-GFP. Another example close to my heart is the azido DCDHF fluorophore: upon irradiation with blue light, an azide photoreacts into an amine (with the loss of N2) and converts a nonfluorescnt compound to a bright emitter. In the next installment (part 2), I will describe the situations where photoswitching is preferred over photoactivation and vice versa. I’ve seen a few papers recently that attempt to characterize the effect oxygen scavengers or triplet quenchers have on the photostability of single molecules. The main parameters they measure and compare across systems and fluorophores is the “on time”—the average time single molecules are fluorescent before they photobleach—and “off time”—the time spent in transient dark states. Here’s my question: What about the emission rate? It’s not enough to report and compare only times. Photostability (either regarding bleaching or blinking) is related to a probability that a molecule will enter a permanent (or transient) dark state for every photon absorbed. The “on time” is only relevant when you also know the rate of photon absorption. Moreover very fast excursions into transient dark states (i.e. triplet lifetimes are typically us or ms—much faster than the camera integration time) will appear as a dimming of the fluorescence, a decrease in the photon emission rate. By removing molecular oxygen (an effective triplet quencher) from solution, fluorophores often become dimmer because the triplet lifetimes increase. Thus, removing oxygen might make your dye last a longer time, but at the expense of brightness. This could more effectively be acheived by just turning down the excitation intensity (with lower background, too)! 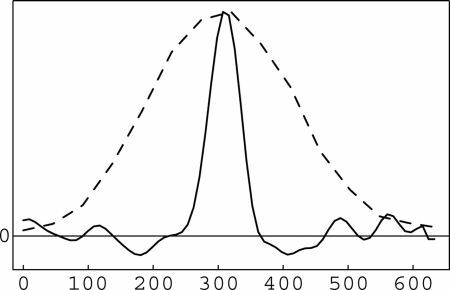 So it makes me want to pull my hair out when I read long, detailed articles in prestigious journals that fail to mention even once the rates of photon absorption or emission when they report “on times” as photostability parameters. 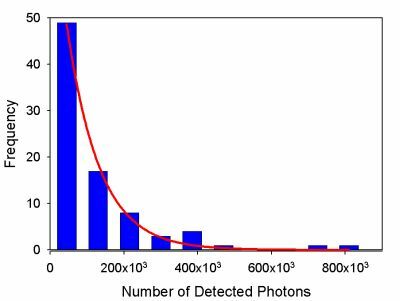 Total number of photons is a more fundamental measure of photostability, but it still not enough for the full picture (it doesn’t report on blinkiness, for instance). Total photons plus “on times” is sufficient; or “on times” and emission rates; or enough variables to define the frikkin’ system. UPDATE: Here’s a good paper that tests specific hypotheses about number and duration of off times. On the Mechanism of Trolox as Antiblinking and Antibleaching Reagent. JACS 2009, ASAP. I’m on vacation with my financier fiancée for a week in South Carolina: a few days at our friends’ wedding, a few days at Hilton Head, and a few days with my soon-to-be in-laws. The weather has been beautiful: heat and humidity reminding of my UNC days. The shark that swam past me gave me the creeps, but otherwise Hilton Head was perfect. One strange event: a friend got a sunburn and a strange rash. The dermatologist asked if she had been making Mojitos or drinking Coronas. Huh? Diagnosis: Phytophotodermatitis. This is really cool: limes (and various other plants) contain furocoumarins (particularly psoralen, structure below), coumarin-type chromophores that absorb strongly in the UV. Psoralens act as photosensitizers: absorbing UV light and releasing reactive triplets or radicals. With fluorescence quantum yields only around 1-2%, psoralens transition to the triplet state (via El-Sayed’s rule, I expect, from the Jablonski diagram below) and phosphoresce strongly. 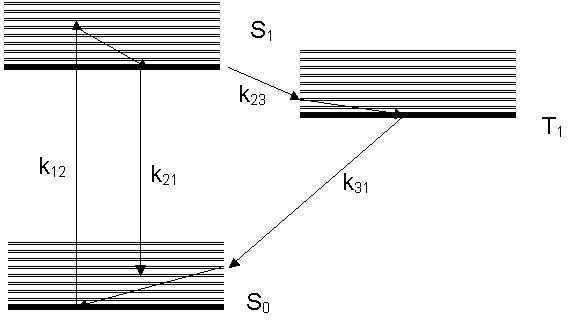 Chromophores stuck in their triplet state can return to the singlet ground state by coupling with triplet O2, producing a highly reactive singlet O2 species. This may be one mechanism of the photosensitizing properties of psoralens. Alternatively, a psoralen molecule in its triplet state can react directly with DNA or other biomolecules with electron-donating capability. Various other photosensitizing reactions are discussed in an interesting review (Kitamura, N.; Kohtani, S.; Nakagaki, R. J. Photochem. Photobiol. C 2005, 6, 168-185). So, basically, my friend was spraying tan accelerator on her skin, then sitting in the sun for hours! That equals strangely shaped splotches of sunburn. In fact, psoralens have been used in photochemotherapy (also called PUVA) for certain skin ailments, such as eczema and psoriasis. So be careful squeezing limes on the beach, or picking parsnips or playing with celery in the sun. Check out some doctory stories in this article: Weber, I. C.; Davis, C. P.; Greeson, D. M. J. Emer. Med. 1999, 17, 235-237. Until recently, I thought FRET stood for “Förster resonance energy transfer”; I figured that “fluorescence resonance energy transfer” was a bastardization used by biologists. But a friend challenged me on that point, claiming that fluorescence was more specific and meaningful than Förster. I was all confused. My reasoning was this: Förster’s equation for long-range dipole-dipole nonradiative energy transfer is a specific case of RET; other cases (e.g. 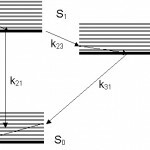 Dexter electron exchange) have different mechanisms and follow different scaling laws. Moreover, because fluorescence is not necessary in the FRET mechanism, I thought it was misleading. But how true is all that? Does Dexter ET count as RET? Is FRET the only way to transfer the potential to fluoresce from one molecule to another? My friend claimed that Dexter should not be called RET, because it is electron exchange instead of Coulombic. So I refer to the experts. The term resonance energy transfer (RET) is often used. 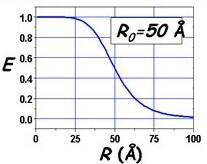 In some papers, the acronym FRET is used, denoting fluorescence resonance energy transfer, but this express is incorrect because it is not the fluorescence that is transferred but the electronic energy of the donor. Therefore, it is recommended that either EET (excitation energy transfer or electronic energy transfer) or RET (resonance energy transfer) are used. That doesn’t help solve the Förster vs. fluorescence dilemma, but instead adds another term (EET, gross) to throw into the mix. But I think this sorta supports my using “Förster” because “fluorescence” is misleading and too broad. 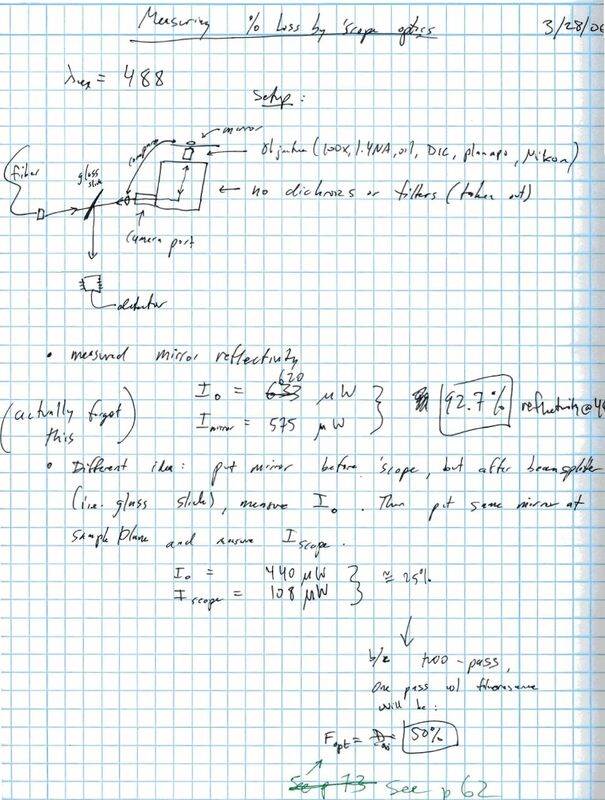 Anyway, good ol’ Bernard goes on to carefully describe the different RET mechanisms and formulas. So what does Joseph R. Lakowicz say? First, he calls it “fluorescence resonance energy transfer,” but then echoes Valeur that RET is a preferable term because “the process does not involve the appearance of a photon.” But Lakowicz also differentiates RET and Dexter electron exchange (because the latter is purely quantum-mechanical). So now I’m mostly reconvinced that FRET should be Förster resonance energy transfer, not fluorescence. That is, RET is the general term for nonradiative excitation-energy transfers, and FRET is a specific mechanism—the specific mechanism applied in practically all biophysical measurements using RET to study distances. What do you think? Am I way off? UPDATE: IUPAC says I’m right. Good single-molecule fluorophores must meet several criteria. To name a few, the molecules must have high quantum yields, must be photostable, with a large absorption cross-section and a low yields into dark triplet states. (Ideally, a single-molecule fluorophore would have some inherent reporter function, but that’s a story for another day.) There are several popular long-lasting, bright fluorophores out there (e.g. rhodamines, terylenes, Cy3); my research involves developing and characterizing new compounds for single-molecule cellular imaging, which means quantifying the criteria I listed above. One measure of photostability is the total number of photons each molecule emits before it irreversibly photobleaches (Ntot,emitted). 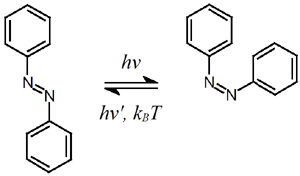 Because photobleaching is a Poisson process that depends on the number of times the molecule reaches the excited state, Ntot,emitted for a fluorophore should not depend on the laser intensity (unless you illuminate beyond the saturation intensity): at a higher intensity, the molecules will absorb and emit photons at a higher rate, but photobleach in less time, yielding the same number of photons than at a lower intensity. So the Ntot,emitted of a particular fluorophore in a particular environment tells you how bright or long-lasting the fluorophore is; the higher the number, the better the fluorophore (all else the same). The distributions are exponential characteristic of a Poisson process. From this distribution, I can determine the average Ntot,detected and convert this to Ntot,emitted using the detection efficiency of my setup (typically ~10% for epifluorescence). From the exponential fit, you can extract the average time before photobleaching for the molecules. This value, combined with the absorption cross section and the laser intensity, can give you the number of photons absorbed per molecule. Using the quantum yield, you can then calculate the Ntot,emitted. So what’s my whole point here? 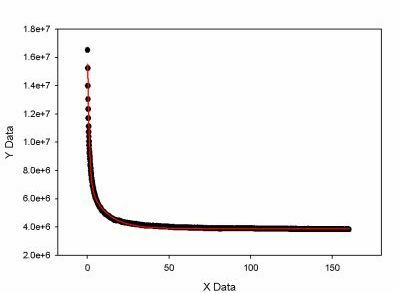 Given that the two experiments I describe use different measurements and calculate Ntot,emitted using different parameters, I was really happy to see that the calculated values of Ntot,emitted were very close from bulk and single-molecule experiments when I compared them directly. That’s all. 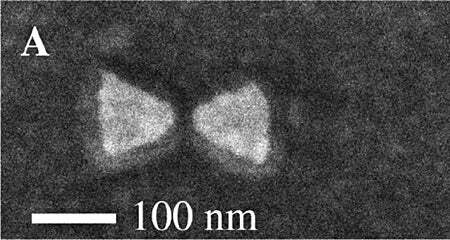 M1 and M2 are mirrors, F1 and F2 are long- or short-pass filters, and DC1 and DC2 are identical dichroics. DC1 reflects short wavelengths and pass long wavelengths, the filters clean up the two paths, the mirrors bring the paths back together, and DC2 combines the two channels. If the channels are offset a little, then short and long wavelengths are split into two copies of the image onto the CCD. So here’s the deal: the detection efficiency for the stream of photons coming from one single fluorophore is kinda crappy (~10%). But that’s the state of the art; it’s part of the reason single-molecule measurements are so tough … and fun!